In November 2016, 16 runners (eight from Belgrade and eight from Zagreb) ran from Belgrade to Zagreb to complete 442 km in a relay run. The event was documented by Vice production and made into a documentary film that was broadcasted on television in Serbia, Greece and Spain. The idea of running from Belgrade to Zagreb was born one year earlier when the border between Serbia and Croatia was closed for motor vehicles for several days due to the migrant crisis (September 2014). 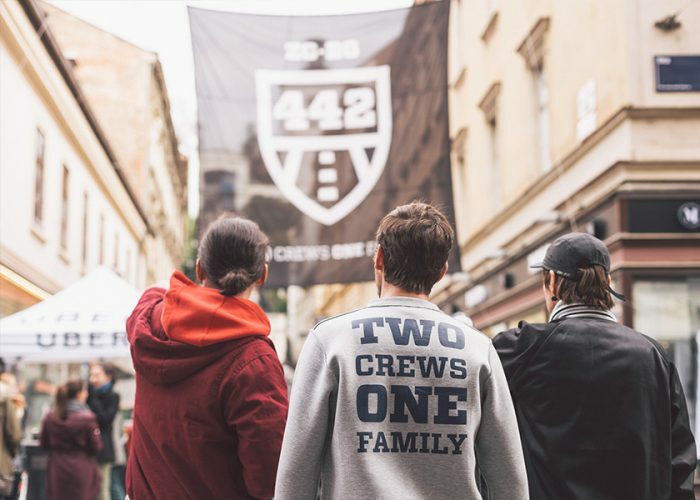 Members of 442 crew from Zagreb and Belgrade decided to run through their borders to meet for a “shake out run” in a “no man’s land.” Using the kilometre distance between Belgrade and Croatia, they coined the slogan: “Two cities, two nations, two running crews UNITED in one family, one crew—442 crew! Belgrade Urban Running Team and Zagreb runners”.